The prototype Spitfire flies over the Supermarine hangar at Eastleigh, Southampton in March 1936, watched by its designer R.J.Mitchell. 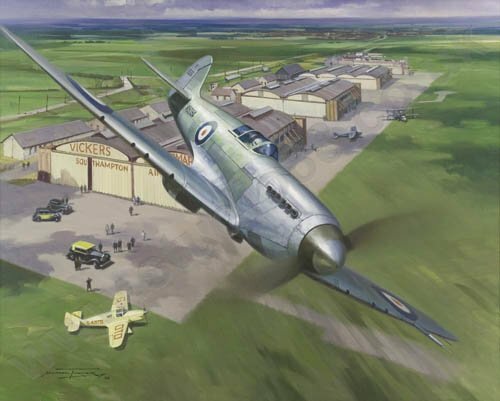 A Limited Edition of 250 prints worldwide, published to commemorate the 70th Anniversary of the first flight of the Supermarine Spitfire on 5th March 1936. Overall print size, including border - 56cm x 48cm (22"x 19"). Each print is individually signed by ALEX HENSHAW MBE and signed and numbered by the artist, Michael Turner.